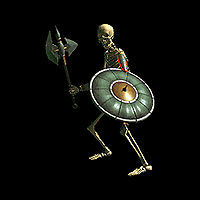 There are a variety of creatures in Battlespire, including several types of Daedra and undead. 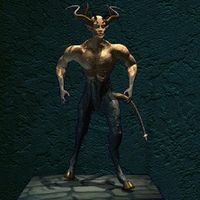 The sections below detail the strengths and weaknesses of each type of monster, including whether you are likely to be able to speak to and gain useful information from them. Dremora are not as strong as other enemies, but can prove dangerous in the early going. 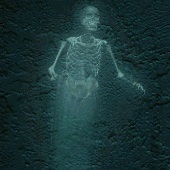 They will often cast three or four spells at the start of combat, but it is possible to avoid these by hiding behind something (such as another enemy) or quickly closing the gap into melee range. 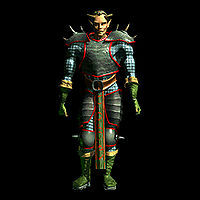 Their melee attacks are also fairly strong, so you may wish to use ranged attacks instead of engaging in close combat. 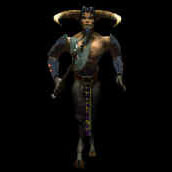 Dremora are somewhat intelligent; it is possible to speak with them, but they will likely attack you. 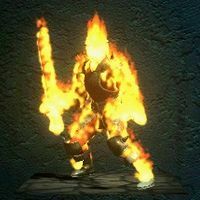 Fire Daedra are fiery elemental creatures. They begin combat with a barrage of fireballs, which can cause significant amounts of damage if you fail to dodge them. Their melee attacks are quite strong as well, but they are weak to frost, so ranged attacks and frost-based spells will prove effective in combat. 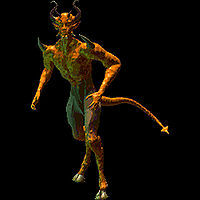 Fire daedra are fairly intelligent and can be engaged in conversation. You can use their dislike of Frost Daedra to your advantage when you speak to them, but you are unlikely to avoid combat when the conversation is over. Frost Daedra start combat with a number of frostball spells, and, like their fire-based counterparts, can be very deadly in close combat for low-level characters. They are weak to fire-based spells. Like Fire Daedra, they can be engaged in conversation and their dislike of Fire Daedra can be used to your advantage, but they will likely attack you after you speak to them. 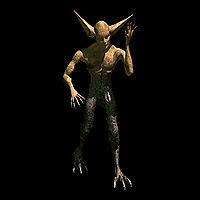 Morphoid Daedra are similar to Scamps and Hernes, and are relatively easy to defeat. 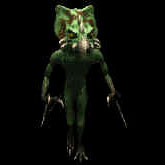 Their attacks deal a moderate amount of damage, but they can be defeated fairly quickly in melee combat. It is possible to have a conversation with a Morphoid Daedra, but it will attack you when you finish talking. Scamps are common, easily-defeated foes. They have no spells, deal little damage in melee, and can be killed in a few hits without having to use up arrows or spells. Scamps will speak to you if you approach them; some will flee, some will attack, and some can actually be befriended through conversation. Seducers are the Dark Seducer's weaker cousins. They will open combat with several spells, so avoid these if you can. They deal moderate damage, so if your class is stronger in melee you may wish to conserve spells and arrows by engaging them in melee; otherwise, ranged attacks may be safer. The Seducers on Level 4 will for the most part aid you in combat, as long as you tell them you're working for their boss. Aside from this, it is difficult to speak to them. Spider Daedra, or Perthan, have low hit points and few spell points compared to some other enemies, but their poison-based spells and melee attacks can be deadly. Like other foes, they will begin combat with a series of spells, so avoid these and fire back with ranged attacks of your own. 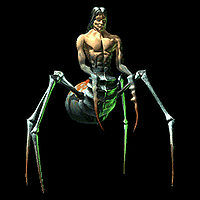 Spider Daedra are moderately intelligent and will speak to you, but don't know much in the way of useful information. Spider Daedra will almost always attack you once the conversation ends. Vermai can be formidable foes at low levels and their melee attacks deal quite a bit of damage. Stay at a range and attack with arrows to avoid their powerful blows. Vermai are not very intelligent, so it is difficult to have a conversation with them, and they will attack you when you are finished talking. This page was last modified on 18 August 2018, at 17:50.